The Last Supper series was commissioned to inaugurate a new gallery in Milan, Italy, located across the street from the site of the Italian Renaissance artist Leonardo da Vinci’s iconic fresco (circa 1495–98) depicting Jesus’s last meal with his followers. Warhol worked obsessively for more than a year on this series, producing more than a hundred Last Supper paintings, both silkscreened and hand-painted, that were some of the largest paintings of his career. 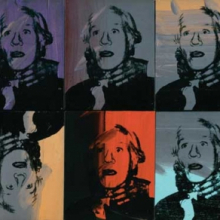 Despite his public proclamations to the contrary, Warhol was profoundly moved by the series. Of these works, he remarked, “I painted them all by hand—I myself; so now I’ve become a Sunday painter. . . . That’s why the project took so long. But I worked with a passion.” These paintings manifest both his religious beliefs—his practice of Catholicism remained private until it was revealed at his funeral—and an irreverence toward the subject, expressed through ironic commercial logos and transgressive repetitions of Christ’s image. The Rorschach paintings feature totemic forms of intricate design that evoke deep mysteries lurking beneath the surface. 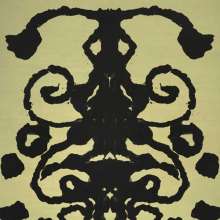 The suggestive quality of these paintings mimics the tests after which they are named, in which patients are given a set of standard inkblots and are evaluated based on their responses to them. 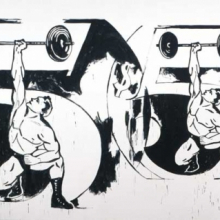 In the larger Black & White Ads like this one, Warhol painted directly on the canvas, tracing over a projection of an advertisement. In technique and appearance, these works revert to Warhol’s earliest hand-painted Pop paintings. The Swiss dealer Bruno Bischofberger commissioned a set of collaborations from three leading artists of the 1980s, each from a different generation. To begin, each artist was given a set of canvases, which were then circulated to the others so they could add their contributions. In this painting we see Warhol’s yellow, screenprinted flower in the center overpainted with Clemente’s faces, and finally a layer of Basquiat’s white screened designs, which give the painting its title. 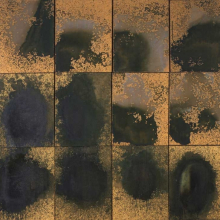 Working with his studio assistant Ronnie Cutrone on the Oxidations, Warhol experimented with the catalytic reaction of urine and metallic paints to create brilliant golds and acidic greens that radiate across richly textured surfaces. By urinating on the canvas, he succeeded in creating the “physical presence” to which he aspired in painting and simultaneously parodied the act of painting. The Oxidations were the first abstractions that Warhol produced and reveal his fascination with and envy of the Abstract Expressionist painters, who had dominated the New York art scene during Warhol’s early career in the 1950s with their active and gestural approach to painting. Ten years after an acquaintance, Valerie Solanas, attempted to assassinate Warhol, he created a series of self-portraits. The self-portraits of 1978—his first in more than twelve years—reveal Warhol, who had just turned fifty, in a period of self-examination, reflecting on his mortality. Here Warhol stages his own strangulation in an image that suggests his previous near-death experience and confirms his obsession with the subject of death. 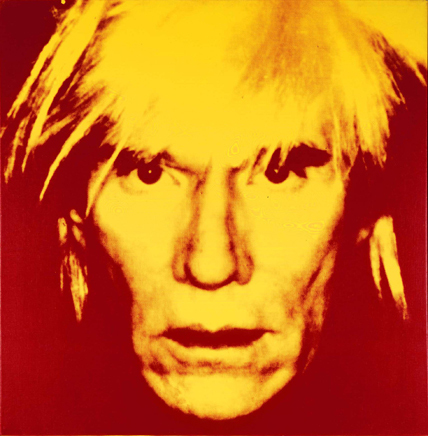 Warhol continued to expand upon his artistic and business ventures with commissioned portraits, print series, television productions, and fashion projects, but he also reengaged with painting. In the late 1970s, he developed a new interest in abstraction, first with his Oxidations and Shadows series and later with his Yarn, Rorschach, and Camouflage paintings. 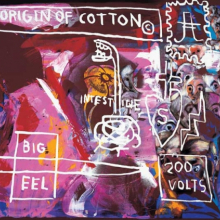 His return to the hand-painted image in the 1980s was inspired by collaborations with Jean-Michel Basquiat, Francesco Clemente, and Keith Haring. The exhibition concludes with Warhol’s variations on Leonardo da Vinci’s The Last Supper, one of the largest series of his career. Together, these works provide an important framework for understanding Warhol’s late career by showing how he simultaneously incorporated the screened image and pursued a reinvention of painting. The Brooklyn presentation is supported by the Martha A. and Robert S. Rubin Exhibition Fund. Additional generous support is provided by the Steven A. and Alexandra M. Cohen Foundation, Inc., and Fashion Concepts, Inc.